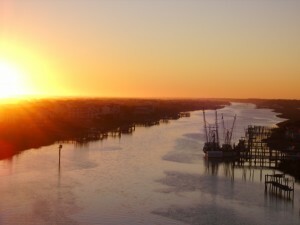 Calabash, North Carolina, has long been recognized as the Seafood Capital of the World. Beginning with outdoor oyster roasts in the 1950s, local fishermen and women built new restaurants and converted existing buildings to restaurant space. Local families, including the Colemans, Becks and Highs, started a home-grown industry that has been recognized around the country, even getting rave reviews in the New York Times. Legend has it that funny man Jimmy Durante’s catch phrase “Goodnight Mrs. Calabash” was meant for the proprietress of an early Calabash restaurant where he and his crew stopped to eat while on tour.